Dating from the Early Neolithic period (4000-3000 BC), Brownshill dolmen in Co. Carlow is one of the most impressive megalithic monuments in Ireland. The capstone is truly massive and has to be seen in person to be really appreciated. It is estimated to weigh in excess of 150 tonnes and is believed to be one of the heaviest capstones in Europe. It is still not certain how it was raised up, but it may have involved a combination of wooden rollers, ropes and man/animal power, aided by ramps of earth or stone. The Brownshill dolmen is classified as a portal tomb by archaeologists and there are approximately 174 of these monuments in the country. The tombs generally consist of two large portal-stones defining the entrance and a back-stone, all of which support the cap-stone. Although Brownshill has never been excavated, finds are known from other portal tombs. These include burnt and unburnt human bone, pottery and flint artefacts as well as personal items such as bone pins and beads. One of the very few portal tombs that has been investigated by archaeologists is Poulnabrone in Co. Clare (Lynch 2014). At this site the remains of twenty two people were uncovered inside the tomb, including sixteen adults and six children. Of these bodies only eight could be sexed and these were equally split between males and females. The bones were found in a largely disarticulated state and this suggests that the human remains had undergone a complex burial ritual. It appears that the dead were initially placed in the tomb as complete bodies and allowed to decompose. Then at a later date certain body parts were removed, in particular the skulls and long bones. The reasoning behind this is uncertain, although it may have been related to some form of ancestor worship, where the dead, via their skeletal remains, continued to play a role in the daily lives of their descendants. A truly ancient monument, Brownshill portal tomb is located just outside the town of Carlow and is easily accessible, with a small car park present and path leading up to the monument. If you are ever in the area you should definitely visit! This entry was posted on January 23, 2018 by nigel borrington. 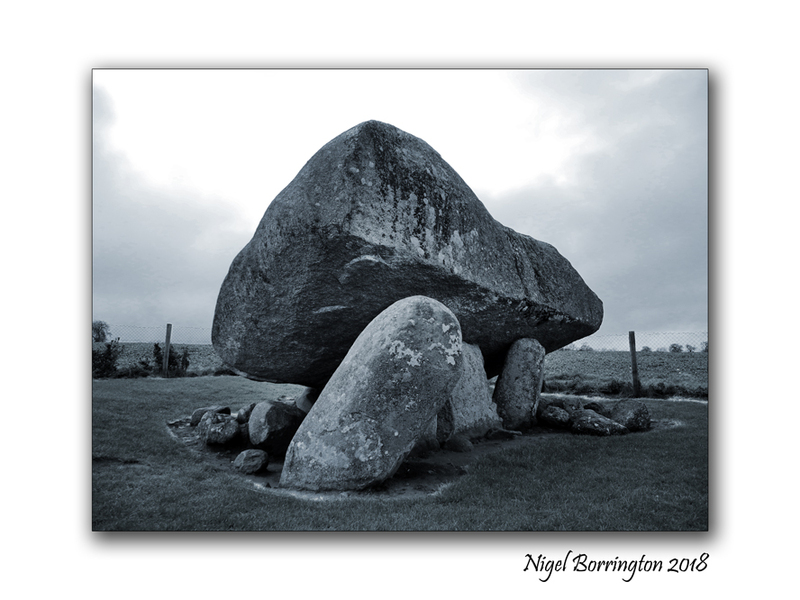 It was filed under Forgotten places, Gallery, irish history, Pagan and was tagged with Brownshill Dolmen, Brownshill Portal Tomb, Co Carlow, Dolman, Ireland, Irish Archaeology, irish history, megalithic monuments, Nigel Borrington.